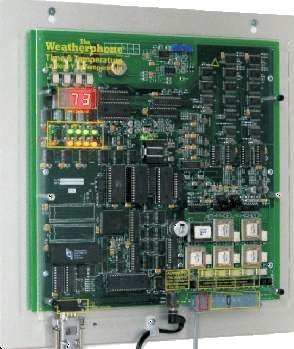 WeatherFone® telephone time and temperature systems offer the very latest in technology and efficiency in the industry. Whether you're replacing existing equipment or entering a new market, WeatherFone® is the choice for you! It'll work for you, too! These are TYPICAL savings, not a fluke! Still Strong After All These Years! Telephone time and temperature systems certainly aren't a new concept, but even with all of the resources available in the new millennium, local telephone time temperature and weather systems continue to be the number one source for time and weather related information! an area's total population are not uncommon! Available with Spanish Vocabulary- A WeatherFone® Exclusive! We do not provide Recording Services or Weather Updates for our Spanish vocabulary systems. You are free to use the voice talent of your choice.